This 2 bedroom apartment with swimming pool is located in Parentis-en-Born and sleeps 4 people. It has WiFi. The apartment is near a beach. Apartment, 4 people, 3 room/s, 2 bedroom/s, 1 bathroom/s, approximately 38 m², 1 floor/s, apartment on ground floor or floor 1. Feature: Property in a holiday complex (max 2 floor(s), 61 building(s) in total, 162 units in total). Equipment: satellite TV; internet access Wi-Fi for 1 device(s) (included); electric heating. Final cleaning of the kitchenette by tenants. Linen/towels available. Deposit € 500 (Visacard, Mastercard, American Express). Cot/​High chair/​Baby bath only within the maximum occupancy, € 30 per stay (on order). Pet 1 pet allowed, € 60 per stay (please advise prior to arrival; additional animals on request only). Estate: closed plot (electric entrance gate with code), trees. Pool (shared use): 200 m², open throughout the entire season, depending on the weather, heated 01/05/19-15/10/19, children's pool, water current. Pool area: tiled, deck chairs, sunshades, external shower. 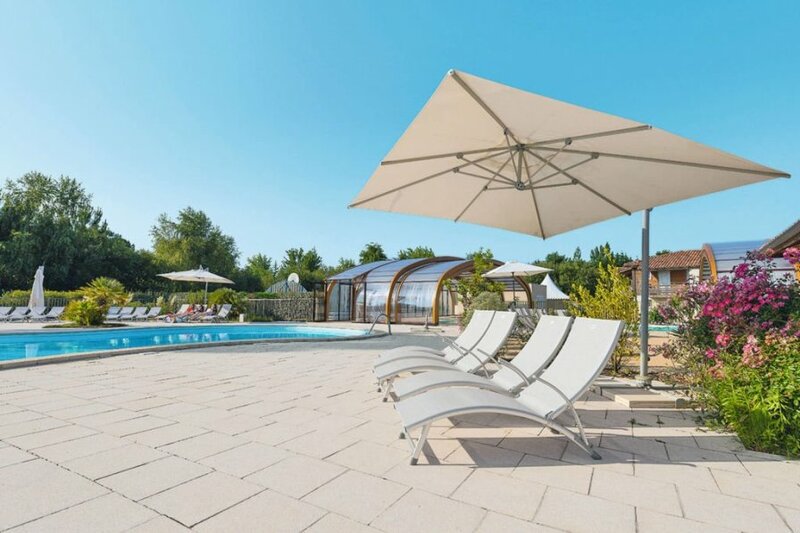 Pool 2 (shared use): 20.0 x 10.0 m, 200 m², open throughout the entire season, depending on the weather, heated, mobile canopy, children's pool. Sports facilities/ leisure time: shared use (free of charge): multi-purpose sports track, bowling/boccia, fitness gym, billiards, table tennis table. Snack bar (approximately June to September). Plot description: terrace or balcony (roofed), furnishing provided. The apartment is described as good value for money. This apartment is located in Parentis-en-Born. It is set in a very convenient location, just 0 metres away from a beach and only 3km away from the city center.